Paper presentations allow authors to present research work, educational experiences, projects, materials and tools. Written proposals should be submitted using the IPCE template and should not exceed 10 pages. Selected papers will be published in the IPCE proceedings. If you wish to present a paper to IPCE, submit your proposal to ipce@ipleiria.pt by February 07, 2014 February 28, 2014. Report presentations allow authors to present educational experiences, projects, materials and tools. This format is particularly suited for work in progress or projects that have yet to be completed. Report proposals should be submitted using the IPCE template and should not exceed 2 pages. 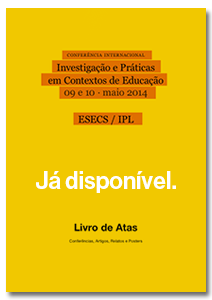 If you wish to present a report to IPCE, submit your proposal to ipce@ipleiria.pt by February 07, 2014 February 28, 2014. Poster presentations allow authors to present research work, educational experiences, projects, materials and tools. IPCE posters provide an excellent forum for authors to present their work in an informal and interactive setting. Therefore, authors in other IPCE tracks are strongly encouraged to complement their submission with a poster about their work. Poster proposals should be submitted using the IPCE poster template. Accepted posters to IPCE should be set up on the first day of the conference and will remain on display throughout the conference (size A0, vertical). Authors must be present at their poster station during the scheduled poster session and prepared for individualized, informal discussion with participants. The Poster Session will last one hour. Each presenter will be assigned to a specific board for their presentation. Presenters must prepare all materials in advance. If you wish to present at the IPCE posters session, submit your proposal to ipce@ipleiria.pt by February 07, 2014 February 28, 2014. Your file should be identified with the type of submission (article, poster or report), with the surname of the main author and their affiliation (example: ArticleSmithIPL or PosterSmithIPL or ReportSmithIPL). After analysis by the Scientific Committee, the Organization Committee will inform authors, by e-mail, February 28, 2014 March 21, 2014 whether their proposal has been accepted. Authors of accepted proposals will be entitled to present their work at IPCE only after at least one author has registered for the conference.